November 11, 2018 marked the centenary of the end the Great War, or the War to End War between the Allied Powers [England, Canada, France, Russia and later the United States] and Germany, Italy, Austria-Hungary and Turkey. During the First World War [1914-1918], about ten million soldiers perished on the muddy battlefields of Europe. They often died for a hundred yards of shell cratered land, or for a line of rat infested trenches. Soldiers who didn’t die in battle ended up without arms or legs, or were blinded, or perhaps even driven mad by the carnage they had witnessed. This was simply called shell shock, today Doctors would call it Post Traumatic Stress Disorder [PTSD]. Tragically, 100 years later, there have been well over 300 other wars, including civil wars, ethnic cleansings and genocides, with close to 200 million men, women and children killed. Many individuals protested the First World War, including American journalist John Reed, who is best remembered for his reportage of the Russian Revolution in October 1917, Ten Days that Shook the World. Others, such as Emma Goldman, Alexander Berkman and Eugene Debs also protested the war. One of the earliest and most important critical voices against the war was Helen Keller. This Remembrance Day many Canadians will show their respect for the soldiers who fell in battle during the First World War, the Second World War, the Korean War, Vietnam, Afghanistan and other conflicts and/or peacekeeping efforts. For the very first time Canadian soldiers who have come back from tours in war ravaged countries such as Afghanistan and who died by their own hand as the result of untreated PTSD will be honoured by the placement of a wreath at the National War Memorial in Ottawa. These soldiers will be further honoured posthumously by being rewarded the Memorial Cross, which is given to families after their loved one has perished during active service. The great majority of Canadians will be wearing the traditional red poppy offered by the Royal Canadian Legion for this period of remembrance. Yet Canadians may be surprised to learn there are a variety of other poppies such as purple, black and white poppies. Purple poppies were created to remember the animals who died in war, such as the work horses slaughtered during the First World War. Black poppies commemorate the African, Black and Caribbean communities who have contributed to various war efforts throughout the decades. It should be noted that Americans do not wear a poppy as a symbol of remembrance on Veterans’ Day in the United States. It is only a custom throughout Commonwealth countries. Currently, it is the white poppy that is beginning to gain popularity as a symbol of remembrance on November 11, especially in Great Britain. The White Poppy: How is it Different from the Red Poppy? In 1921, the red poppy was introduced in the United Kingdom as a symbol of remembrance. Later, in 1926, a member of the No More War Movement put forward the idea of pacifists making their very own poppies. Their intention was to remember the casualties of all wars and to hope for the end of all wars. To the members of the No More War Movement the red poppy symbolically signified only the British military dead. They even proposed that the black centre of the British legion’s red poppy be imprinted with “No More War.” However, the Movement did not follow through on their ideas. The first white poppies were sold in 1933 by the Co-operative Women’s Guild. White poppies were founded by women who had lost husbands and other loved ones in the First World War. They were personally aware of the trauma and overwhelming realities of war. They worried that the traditional red poppies had become associated with celebration of the armed forces rather than the original remembrance message of “never again,” that emerged after the First World War, and which pacifists feared was slipping away. Then in 1936, the Peace Pledge Union [PPU] participated in their distribution, and white poppy wreaths were laid from 1937 as a pledge to peace that war would never happen again. Today, anti-war organizations such as the Anglican Pacifist Fellowship now support the White Poppy Movement. Furthermore, those who promote the wearing of the white poppy point out that the red poppy also conveys a defined political perspective, and point to the divisive symbolism of the red poppy in Northern Ireland, where it is worn mainly by Unionists but boycotted by Irish Republicans. A lot of people struggle every year with the symbolic meaning of wearing either a red or white poppy or perhaps not wearing a poppy at all. Falklands war veteran Simon Weston previously said he believes those who think the red poppy glorifies war are “hijacking a campaign that helps families of the injured and the dead.” But in 2014, Royal Air Force veteran and activist Harry Leslie Smith tweeted to say that he was against wearing a poppy. The Royal British Legion [RBL], which sells the traditional red poppy, states that it is not a sign of support for war and death. Instead, the RBL considers the red poppy a symbol for remembrance and hope which should never be seen as a symbol of religion or politics. Nonetheless, many people, especially peace activists, feel the red poppy has become political, and that too many politicians use it to help justify war. The Royal British Legion says it is “defends the right to wear different poppies” and even some of its volunteers were different colours symbolically side by side on Remembrance Day. However, the RBL will not sell red poppies alongside other colours, such as the white poppy, because it may cause confusion. Furthermore, the Royal British Legion highlights the fact the red poppy raises money that is used to support Britain’s Armed Forces, veterans and their families in their time of need. The white poppy was created in 1933, only twelve years after the red poppy. In the U.K., non-traditional white poppies are distributed by the Peace Pledge Union [PPU], the United Kingdom’s oldest secular, pacifist group. According to Hill, sales of the white poppy this year – the 100th Anniversary of the end of the First World War – have been “going very well” and the pacifist group has already sold more than 75,000. “There is a realistic chance we might exceed the record,” Symon Hill said. While sales of the white poppy may be on the rise, they still have a long way to go before they match the number of red poppies distributed every year. The Royal British Legion expects to distribute more than 40 million red poppies in 2018. Yet white poppies have also been worn to commemorate Remembrance Day in New Zealand. In previous years, the White Poppy Annual Appeal was also run as a fundraiser for Nuclear Disarmament around the time of Hiroshima Day in August. However, responsibility for the annual appeal was transferred to Peace Movement Aotearoa, as the Campaign for Nuclear Disarmament in New Zealand closed down in 2008. However, those who oppose the white poppy argue that the traditional red poppy already encompasses the very same sentiments claimed for the white poppy, such as “remembering all victims of war.” Moreover, those opponents also claim the white poppy undermines the message of remembrance. Yet some groups such as the Northern Irish Nationalists see the red poppy as a political symbol used primarily for remembering British war dead and not those who were victims in wars against the British. In the 1930s, when the white poppy was first established, a number of women actually lost their jobs for wearing the white poppy. In November 2014, white poppy wreaths placed on the Aberystwyth War Memorial had to be replaced after they were removed from the Memorial and thrown in a garbage bin. The Peace Pledge Union has seen a 30% increase in the number being sold compared to this time last year  and if the trend continues, the number of white poppies distributed will exceed 125,000. The charity puts the money received from poppy sales towards their educational pacifism programs. The PPU has witnessed increased interest from churches and schools, selling at least 60 white poppy school packs, doubling the number of orders they received last year. This year also marks the first time Britain’s St John’s Ambulance will allow their volunteers to wear the white poppy. The 141-year-old first-aid organization changed their dress code ahead of the centenary of the First World War Armistice welcoming the Peace Pledge Union’s alternative poppy. Every year Peace Pledge Union is inundated with aggressive messages from social media trolls denouncing the organization that supplies the white poppies, insulting Symon Hill and also all white poppy wearers, which number about 100,000 people a year. Hill commented that given the term ‘snowflake’ is supposed to mean something like ‘easily offended’, the people who describe us in this way do same rather…well, easily offended. Every year, there are people who assume that white poppies are a recent invention. Hill believes Conservative MP Johnny Mercer didn’t check his facts before accusing “attention seekers” who wear white poppies of trying to “hijack” the poppy. Hill says that white poppy wearers have always included a number of ex-soldiers. He could even introduce Johnny Mercer to a D-Day veteran who wears a white poppy. Hill doubts that even Mercer would call the veteran an attention-seeker, especially since he sold off all his medals to feed his children. Hill commented that it is an insult to veterans and thousands like him to use language of freedom and honour when they [the veterans] faced wasteful death or grinding poverty. Furthermore, Hill said critics of the Peace Pledge Union’s campaign say white poppies are political. Of course they’re political, he says, and so are red poppies. Anything that represents particular values and principals is political. Hill stated that remembrance means thinking about what we remember, who we remember, why we remember. We’re not afraid of political comments, if that means upholding values that flow from remembering victims of war. Hill believes that the British Legion, which supplies the traditional red poppies, argues that remembrance should be solely about British and Allied armed forces personnel killed during war. Tragically, civilians are left out, such as the over 60,000 British civilians killed in World War II. Moreover, people who were on a different side due to an accident of birth are simply ignored. Peace Pledge Union also questions why governments are more than willing to put billions of dollars into waging war but believe it is somehow acceptable for veterans to rely on charitable organizations rather than giving them decent financial support from the state. The red poppy was first adopted as a symbol of remembrance in Canada in 1921, six years after Lieutenant-Colonel John McCrae of Guelph, Ontario wrote his famous poem, “In Flanders Fields” about the blood-red flowers that grew abundantly over battlefields in northern France and Belgium. Since then, the traditional red poppy has been worn by generations of Canadians as a symbolic gesture of remembrance in honour of veterans who perished during times of war. Every November 11th, at 11 a.m., Canadians commemorate the signing of the Armistice agreement by the Allies and Germany which ended the First World War in 1918. In Canada, the legion’s enmity for the controversial white poppy has been partially fuelled by the misconception that peace activists believe the red poppy represents a glorification of war, Heather Menzies of Canadian Voice of Women for Peace says. It has been almost six years since Canadian Voice of Women for Peace organized a low-key white poppy campaign and was quickly met with harsh opposition from the Royal Canadian Legion. The organization, which promotes peace and remembrance of civilian casualties of war, intended for the white poppy campaign to initiate a discussion between Canadians about how we choose to reflect and honour veterans on Remembrance Day. Unfortunately, the debate descended into rancor. Canadian Voice of Women for Peace readily admits the Royal Canadian Legion’s opposition has undermined the popularity of the white poppy, with only 1,200 of the pale, homemade poppies distributed in 2016, in advance of Remembrance Day. In February 2011, Canadian Voice of Women for Peace met with the Royal Canadian Legion’s leadership to mediate a compromise, but the veterans weren’t interested, said Menzies. “I thought we had made some progress in shifting the paradigm on what would be the focus of Remembrance Day,” says Menzies, whose great uncle was the victim of a gas attack during the First World War, and whose father was wounded by shrapnel while serving in France and Holland during the Second World War. Since that episode, Canadian Voice of Women for Peace has quietly moved forward with its white poppy campaign, undaunted by the thought it hasn’t gained much momentum. Lyn Adamson, the co-chair of the women’s group, says wearing a white poppy is not meant to show disrespect toward veterans, and more importantly, it can help open a broader discussion about the true cost of war. That’s why Adamson wears both a red and a white poppy at this time of year. “We do want to remember those who have given their lives by following the instructions of their country in sending them to war, but we also want to remember the civilian deaths,” Adamson says, adding that building a culture of peace involves talking about Canada’s multibillion-dollar arms industry and the Federal Government’s decision in June  to boost defence spending by 70% over the next 10 years. The white poppy emerged as a symbol of peace in 1933, when the Women’s Co-operative Guild in Britain was searching for a way to show that their members were against war and advocated for non-violence. Marian White, a volunteer with the Island Peace Committee in Charlottetown, Prince Edward Island, says the red poppy is too closely associated with extolling the heroic virtues of the military – a position the Legion has strenuously rejected. In November, 2017, a spokeswoman for the Legion’s Dominion Command in Ottawa said the organization, which represents 275,000 veterans and distributes millions of traditional red poppies every November, would not comment on the white poppy movement according to the Canadian Press. Canadian Voice of Women for Peace co-chair Lyn Adamson, told Global News in October 2018, that they had reached out to the Royal Canadian Legion to sort out the disagreement years ago, but it didn’t work out. “We thought we could work together, because honestly for everyone, preventing future wars should be a common element,” Adamson said. She noted though that the white poppy is not meant to replace the red poppy – nor is it meant to be disrespectful. She further explained that “It’s broadening it out to be more inclusive of all of the victims of war.” Moreover, Adamson explained another purpose of white poppies is emphasizing that peace is always the better avenue. In past years, the Royal Canadian Legion has called the white poppies – some with the word “peace” appearing in the center – an insult to veterans and a possible copyright violation because the Legion owns the trademark on the poppy. Furthermore, in 2010, the Legion threatened to launch a lawsuit to stop the alternative poppy campaign drive. 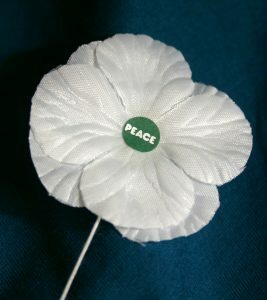 That legal threat has prompted other peace groups to be hesitant in adopting the white poppy as a peace symbol. This year marks the first time that Britain’s St John’s Ambulance will allow their volunteers to wear the white poppy and the the 141-year-old first-aid organization changed their dress code ahead of the centenary of the First World War Armistice welcoming the Peace Pledge Union’s alternative poppy. However, the Canadian chapter of St. John Ambulance said it won’t follow the lead of its British counterpart in allowing the white poppy to be worn on Remembrance Day. Furthermore, the poppies commemorate civilian victims of war and encourage people to challenge the “normalization” of militarism. The growing demand for peace poppies highlighted the need for Remembrance Day activities to reflect the growing diversity of Canadian perspectives on war and remembrance and to also acknowledge the war experiences of many immigrant Canadians. With this in mind, Vancouver Peace Poppies partnered with The BC Humanist Association in 2016 to co-host “Let Peace Be Their Memorial,” a Remembrance Day wreath-laying ceremony to commemorate refugees and other overlooked victims of war. The following paragraphs are from the closing statements delivered by Teresa Gagné, co-founder of Vancouver Peace Poppies, who spoke at the 2016 ceremony. We need to commit ourselves to counting all the different costs of military conflict: the social costs, the environmental costs, the desperate refugees, the lost potential of 50 million children whose schooling is disrupted by war, the women traumatized, abducted or sexually assaulted, the conscientious objectors who sometimes pay with their lives for standing up and refusing to fight, the psychological costs of PTSD on veterans and civilians. We need to include all those things and we owe it not just to ourselves to do so; I would say we even owe it to our military. If we ask somebody to risk not just their physical health, but also their mental health, on a military endeavour, we’d better be sure it’s likely to succeed and that in the cost-benefit analysis, it’s worth the costs. So I don’t see any disrespect to the military in saying, ‘Let’s count all the costs of war and evaluate if it’s really going to achieve what we want to achieve.’ If we don’t do that and find a better way, we will really have ‘broken faith’ with those who died and with those who will continue to die. • commemorate all victims of war. • mourn the environmental devastation it causes. • reject war as a tool for social change. • call for dialogue and peaceful conflict resolution. • show your commitment to building a better future. Because Remembering is important, but it isn’t enough. In closing, the acclaimed British poet and novelist Robert Graves, born in 1895 of part Irish and German descent, enlisted in the military at the outbreak of the First World War. He was commissioned as a captain in the Royal Welsh Fusiliers. In 1916, Graves was badly wounded at the Battle of the Somme and reported missing. Robert Graves would survive the horrors of what many of his contemporaries regarded as “The War to End War,” and go on to write an autobiographical account of the First World War, ‘Goodbye To All That’ . Later he would publish ‘I Claudius’ , ‘Claudius the God’ , ‘The Golden Fleece’ , ‘King Jesus’ , ‘The Greek Myths’  and numerous other volumes of fiction, history, essays and poetry. Although Robert Graves wrote a variety of poems, including romantic ones, he also wrote many explicitly realistic poems about trench warfare and so I have included one brief example here. Dribbling black blood from nose and beard. * Oxford Dictionary of Current English – 2006. Boche: informal, dated. German soldiers. Origin: French, ‘rascal’. 1. Francesca Gillett – ‘White Poppy: How is it different from the red remembrance symbol?’ – October 25, 2018, BBC News. 2. Howard Zinn and Anthony Arnove – ‘Voices of a People’s History of the United States’ – Seven Stories Press – Second Edition 2009, pp. 283-284. 3. 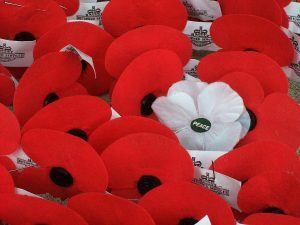 Wikipedia – ‘White Poppy’ – November 1, 2018. 4. Izzy Lyons – http://telegraph.newsprints.co.uk/ – November 2, 2018. 5. Symon Hill – Blog Post – November 2018. 6. Michael MacDonald – ‘White Poppies: Why a symbol of peace has never really caught on in Canada.’ – November 2017, the Canadian Press. 7. Maham Abedi – ‘Why white poppies – meant to be a symbol of peace are so controversial’ – Global News Online – October 20, 2018. 8. Teresa Gagné – ‘White Poppies: New Remembrance Day ceremony highlights the true costs of war’ – November 10, 2017. 9. Robert Graves – ‘Goodbye To All That’ – Introduction by Raleigh Trevelyan – The Folio Society – 1997, pp. 7-9. 10. Robert Graves – ‘Goodbye To All That’ – Epilogue by Robert Graves – The Folio Society – 1997, p. 294. 11. Yves Engler – ‘Canada and Israel: Building Apartheid’ – Red Publishing/Fernwood Publishing – 2010, pp. 24-25. Thank you for this article of historical importance on the white poppy .